Difficult as it is, a household move can become even harder if you have to clean both of the residences on your own. If you are a tenant, your landlord will want you to leave the house in a broom clean condition and make it a pleasant residence for some future tenants. Also, deep cleaning of your new residence will allow you to have a fresh start in an impeccable house. Normally deep cleaning is not the first thought that crosses your mind when it comes to moving house. There are a lot of more important tasks like organizing the move, researching and hiring reputable movers, packing for the big day, taking care of the paperwork. However, you will have to deal with the cleaning task eventually, so you should add it to a moving checklist as soon as possible, whether you are doing it yourself or hiring professional cleaning services. Obviously, the bigger home you have, the more time it will take you to clean it. 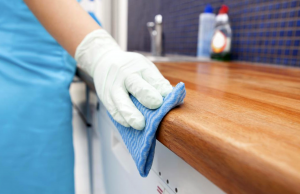 Save yourself the trouble and delegate this task to a cleaning company while you are taking care of other, probably more important issues that need to be dealt with personally. Professional cleaning companies are handling move-out and move-in cleaning on a daily basis, so you can rest assured that your place will be cleaned efficiently and thoroughly. – Although you know how to clean your place, due to lack of time, you may not be able to clean all the areas efficiently. You can rest assured that professional cleaners will clean your appliances inside out as well as all cabinets and drawers and any other spots that you may or may not notice during a regular cleaning. – Leaving the house in a perfect condition allows you to get your full deposit back. If your landlord is forced to clean himself or pay for the cleaning services, he will probably make deductions from a tenancy deposit. Landlords are allowed by law to withhold deposit in case there are missing or damaged items or if you leave the apartment dirty and untidy. – Hiring professional cleaning company when moving house will ensure your peace of mind. Always try to get a recommendation from a friend who has been through the similar situation recently. – If you are moving out from your own property and you are intending to rent it, you should prepare it for your prospective tenants. Keep your property clean and tidy so that you can ask your tenants to do the same. – Delegating some of the moving-related tasks to the third party will significantly reduce the amount of stress accumulated throughout the moving process. Not only will you get more time to handle other important tasks, but also you won’t feel so tired and overwhelmed. – If you hire professional cleaning company which is properly licensed and insured, your items will be safe with their employees. You can always choose whether you are going to hire an independent cleaner or cleaning company. When contacting cleaning companies make sure you ask the right questions. Most of them charge per hour, but some of the cleaning companies may charge a flat rate. Also, depending on the workload and the time-frame they will advise on how many cleaners will be engaged in this task. Ask about what kind of cleaning supplies will be used. If you are insisting on organic cleaning supplies, do share your expectations and requests when you first call the cleaning company. After all, whether you are renting or selling your property, keep in mind that perfectly clean and well-maintained house will certainly impress prospective tenants or buyers. How can you benefit from hiring movers?